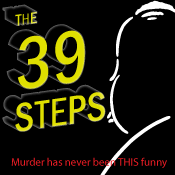 Our prices are already low, but now enjoy 50% off with this Buy 1 Get 1 Free deal for the 8/5/2012 2pm performance of "The 39 Steps". Don't miss it! Latecomers will be seated at the discretion of the house manager, and may be asked to sit in the most conveniently located seats until intermission. Please arrive early to give yourself time to park, pick up tickets, and be seated. All ticket orders will be held at Will-Call at the ticket window. We have a no-refund policy, although we will exchange your tickets for a different performance date if possible. Please note that our box office phone number is staffed by volunteers, and you may have to leave a message. Your message will be returned as soon as possible!